Fresco is an Ancient painting technique in which pigment suspended in alkaline limewater is applied to a damp lime plaster surface. Fresco should not be confused with limewash or a patina coat that is applied on dry plaster. These applications are referred to as Secco. Fresco is only for use on pure lime plaster, and must be applied while the plaster is still damp. It cannot be applied to cement, or lime with cement (sometimes referred to as lime stucco) and cannot be applied to plaster once it is dry. During the curing stage after application onto the wet plaster, pigmented limewater will carbonate with the plaster, and the pigment will become an integral part of the lime plaster surface. Fresco can be used on either interior or exterior lime plaster or render. 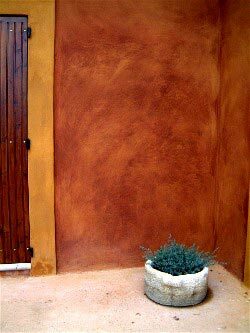 Shown above is an integrally colored lime plaster using a natural red iron oxide pigment. Without a Fresco application (top half) the result is a tint, or lighter version, of the original pigment shade. The bottom half has the Fresco technique applied, resulting in a color more closely matching the depth of the original pigment (shown at right). Plaster need not be integrally colored. The Fresco technique is a beautiful way to obtain maximum color depth on a white wall. Slowly stir your hydrated lime powder into water until completely slaked (wetted). Allow it to sit and separate. Once it has separated, stir and allow it to separate again. The water from the top of this mixture is now alkaline limewater. You may see some crystals floating on top of the water. They can be scooped out and discarded. When measuring the limewater for your pigment, avoid remixing the lime from the bottom of the bucket, but take only the clear water from above. Mix this limewater with your pigment at a ratio of 1 part pigment to 3-5 parts limewater for Natural Earths and Ochers or our French Mineral pigments. Use 1 part pigment to 10 parts water for Oxide pigments. Note that the best results will be obtained with Natural Earth and Ocher pigments. Anywhere from 2 to 5 hours after plaster application when your render is still wet but has begun to set, you are ready to apply the Fresco. This timing is critical for best results. Less satisfactory results will occur if the plaster is allowed to dry too much. Apply your limewater with a good quality synthetic bristle brush, (such as the Sherwin-Williams Deck & Siding Brush). Apply the pigmented limewater with a cross-hatching and swirling technique, working the color into the surface. Do not apply it in long strokes as you would paint as this will result in streaking. It is imperative to stir the mixture from the bottom of the bucket with the brush between EACH pass. The pigment will quickly settle to the bottom causing an uneven application with some areas lighter than others if you do not follow this procedure. In a proper Fresco application, your result will be a surface with some subtle variation in depth. This creates a beautiful hand worked finish different from the monotone, flat color of paint. This new Fresco application must be protected from rain for 3 weeks in order for the skin of lime crystals to carbonate over the pigment and seal it. When applying lime plaster or render it is important for both esthetics and function to not apply a watertight sealant. Sealing the surface from the air will interfere with the necessary carbonation process of the lime. During the curing of the lime plaster, an invisible layer of lime skin will cover the surface color as well, sealing it into the plaster. As time passes this carbonization will produce a beautiful tonality to the color you have applied. Note about brushes: Limewater is highly alkaline and corrosive to metallic parts on brushes. Clean your tools and brushes promptly with water after use. 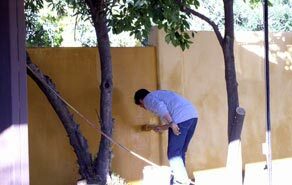 Shown above is an exterior wall using Dark Yellow Ocher pigment for the Integral color, with a fresco application in progress. Brushing of the pigmented limewater onto the damp plaster is being done after the plaster has been floated with a sponge to create a smooth texture. The color is worked into the surface rather than using wide sweeps of the brush. Here an entryway was done in Dark Yellow Ocher plaster with Red Ocher and Yellow Ocher Fresco. Notice that the Red Ocher on top of the Yellow produces striations of different tones rather than a monotone surface. This is an extreme example of a bad Fresco application. The streaking visable indicates several improper application techniques including poor timing, brushing up and down and not mixing the solution with each load of the brush. As lime plaster dries, it cures through a process called carbonation. The lime in the render returns to its original form - limestone - with its strong crystalline structure. Pigments mixed with alkaline limewater chemically bond with lime plaster and become integrated as the lime plaster and limewater carbonate together. Forming crystals, a skin of sorts bonds over the pigment. The longevity of the chemical and physical bond of pigment and lime can be seen today in the ancient Fresco's of the world. While the deepest color can be achieved by integrally coloring the plaster, pigmented limewater can also be applied on top of plain white plaster for a different effect. In contrast to the Fresco application of pigment on top of WET plaster, Secco refers to the application of pigment with an additional binder on top of DRY plaster. There are two distinct types of Secco; Patina Coat and Lime Wash.
Patina Coat The Patina Coat is very close to the fresco. Although it will not produce as deep a shade, it's a more practical option for many. Rather than applying the pigment while the plaster is still wet, the Patina can be achieved from 1 day to 3 months after the plaster has been applied. Once the final coat of plaster has dried, mix 1 part lime to 20 parts water. Add 95% pigment to the weight of the dry lime for Natural pigments or 55% the weight of the dry lime for Oxide pigments. Ochers and natural earths will produce the best results. Follow the same application instructions as a Fresco. This application allows you to use more pigment for a deeper color than a wash while taking advantage of the carbonation phase of the plaster. It is recommended to use an additional binder of Casein with this mix for best results. Lime Wash At any time after a plaster has dried, a Lime Wash can be applied. Lime Wash recipes can vary in the amount of water used. The pigment load or amount of pigment added will depend upon the water to lime ratio. A typical example might be 1 kilo of lime to 6 quarts of water with 500 grams of pigment. As with the Patina coat, a supplementary binder is recommended. There is a lot of misconception or misunderstanding concerning the definition of what is actually a lime plaster. Lime Plaster refers to a mortar using only pure lime as a binder and sand as an aggregate. Too often common mortars made out of lime, cement, and sand are improperly called lime plasters simply because they include some kind of lime. The correct name for such a product is stucco, cement stucco, or lime-based stucco. The addition of cement to lime dramatically changes the physical, mechanical, and chemical properties of the lime by reducing its elasticity, breathability (vapor exchange), and durability as well as altering the color rendering. As a matter of fact, lime is commonly added to cement in order to mitigate these properties. Mixing Hydraulic or Hydrated Lime, or both, with aggregates, achieves a true lime plaster.¹ ¹Michel Couvreux, Building Green TransMinerals, USA. Fresco and Secco applications can be achieved on either Hydrated Lime or Hydraulic lime. 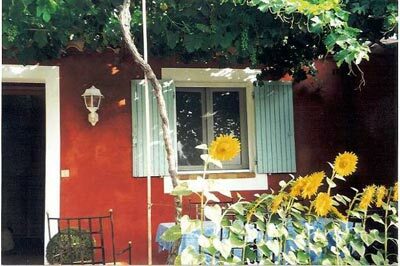 This lovely Provence home is done in Red Ocher plaster with a Fresco application of Red Ocher pigment on top. This reproduces the dark tone of the pigment that could not be achieved with lime wash.